Many of the larger data recovery firms have interns working for them at no charge while they learn. Do you really want a college student to learn on your drive with your irreplaceable data? 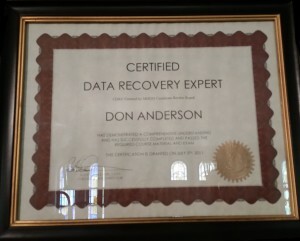 Don Anderson handles all the recoveries personally in his secure lab. No other clientele has access to your confidential data. If you are local to the Philadelphia region and need data recovery services, call to schedule an appointment and Don Anderson will give you a personal tour of the facility and explain how the recovery process works.